Hi readers! One of my favorite bloggers and August scuba press trip attendee just posted the loveliest blog about her recent trip to Rome. Holly B is one of my favorite journalists to travel with - she's delightful, charming, funny and so thoughtful! 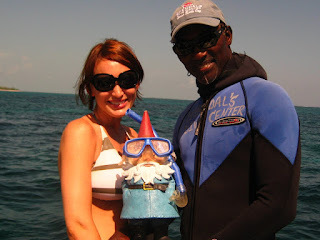 She sent me my very own Travelocity Roaming Gnome after our Bahamas adventure and he now resides on my desk to remind me of the time we strapped a rum punch on him for a photo opp. Anyhow, check out her very popular blog * for a story that will quite possibly leave you in tears. I'm still kvelling. *TIP: You can get updates to Holly's blog, as well as those from many other pals, in the blog feed on the right side of B.A.A.